What You Should Know About The Iran Nuclear Deal : The Two-Way The deal to curb Iran's nuclear program for six months is being called historic, and it's perhaps President Obama's most unlikely and most meaningful foreign policy accomplishment. But the deal still leaves many open questions, and it's only a beginning. This is what you need to know. 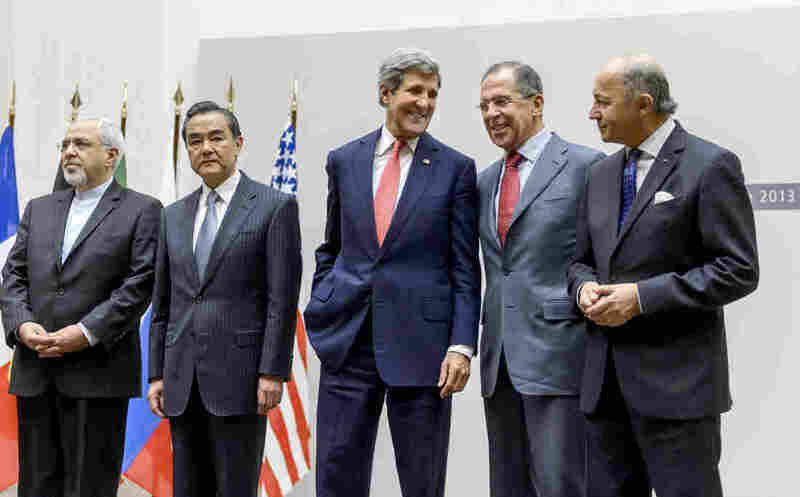 Iranian Foreign Minister Mohammad Javad Zarif, Chinese Foreign Minister Wang Yi, U.S. Secretary of State John Kerry, Russian Foreign Minister Sergei Lavrov and French Foreign Minister Laurent Fabius react during a statement early Sunday in Geneva. Just before the sun rose on Geneva on Sunday, international negotiators emerged to announce Iran and world powers had reached a deal to curb Iran's nuclear program for six months while the two sides work out a permanent, more sweeping solution. Today, the deal is being called historic. USA Today says it may be President Obama's most unlikely and most meaningful foreign policy victory during his time in office. In short, it is the first time in about a decade that Iran has agreed to halt some of its nuclear activities. Also, this is the most tangible outcome of a newly thawed relationship between the U.S. and Iran. Remember, the two countries have had no formal ties since the 1979 Iranian Revolution. That all changed when Obama and Iran's new, moderate president, Hassan Rouhani, exchanged letters in September. Later that month, after Rouhani set a new tone during his first visit to the United Nations, the two leaders exchanged a historic phone call. After marathon negotiating sessions, which included two trips to Geneva by Secretary of State John Kerry, Iran reached a deal with the five permanent members of the United Nations Security Council (U.S., Russia, China, U.K., France) plus Germany. During a rare Saturday night address, Obama told the country that while this is "just a first step, it achieves a great deal." "Today, that diplomacy opened up a new path toward a world that is more secure — a future in which we can verify that Iran's nuclear program is peaceful and that it cannot build a nuclear weapon," Obama said. Perhaps the most succinct analysis of the deal was tweeted by Ali Vaez, a senior Iran analyst for International Crisis Group, which describes itself as an "independent, non-partisan, source of analysis and advice to governments, and intergovernmental bodies." Vaez tweeted: "Like hurdling track and field, springing over the first obstacle does not guarantee victory. But without it the race is lost." -- The Fine Print: As the White House explained the deal in a "fact sheet," Iran has agreed to halt any enrichment above 5 percent and neutralize any of its stockpile that is near-20 percent. Iran has also agreed to "unprecedented transparency and intrusive monitoring" of its nuclear program. In return, the U.S. and its partners have agreed to drop some of its sanctions, amounting to about $6 to $7 billion in relief. -- On Some Enrichment, They've Agreed To Disagree: One of the toughest diplomatic dances that happened in this agreement is about Iran's "right to enrich." Iran has insisted that the world recognize it has a right to enrich uranium for peaceful means. The U.S. has insisted that it has never recognized that right for other countries and it would not do so for Iran. As The New York Times reports, the two sides have agreed to let ambiguity rule in this case. "American officials signaled last week that they were open to a compromise in which the two sides would essentially agree to disagree on how the proliferation treaty should be interpreted, while Tehran continued to enrich," the Times adds. That is: Iran will claim the world has acknowledged its right to enrich; the U.S. will say it has not. -- Israel Is Not Happy: "What was concluded in Geneva last night is not a historic agreement, it's a historic mistake," Israeli Prime Minister Benjamin Netanyahu told reporters. "It's not made the world a safer place. Like the agreement with North Korea in 2005, this agreement has made the world a much more dangerous place." Netanyahu especially objected to the lifting of any sanctions. "Without continued pressure, what incentive does the Iranian regime have to take serious steps that actually dismantle its nuclear weapons capability?" Netanyahu said. Obama addressed some of these concerns last night, saying if Iran does not meet its obligations, the sanctions can be rolled out again. "The broader architecture of sanctions will remain in place and we will continue to enforce them vigorously," Obama said. "And if Iran does not fully meet its commitments during this six-month phase, we will turn off the relief and ratchet up the pressure." Obama and Netanyahu spoke by telephone in the afternoon. "The two leaders reaffirmed their shared goal of preventing Iran from obtaining a nuclear weapon," White House said in a readout of the call. "Consistent with our commitment to consult closely with our Israeli friends, the President told the Prime Minister that he wants the United States and Israel to begin consultations immediately regarding our efforts to negotiate a comprehensive solution." -- The GOP Isn't Happy: Politico reports that shortly after negotiators in Geneva announced they had reached a deal, Congressional Republicans began panning it. "Congressional Republicans questioned whether the deal would actually prevent Iran from developing a nuclear weapon because they will still be able to enrich uranium — something the nation says is needed for power plants. "'This agreement will not 'freeze' Iran's nuclear program and won't require the regime to suspend all enrichment as required by multiple UN Security Council resolutions,' Sen. Marco Rubio (R-Fla.) said in a statement. 'By allowing the Iranian regime to retain a sizable nuclear infrastructure, this agreement makes a nuclear Iran more likely. There is now an even more urgent need for Congress to increase sanctions until Iran completely abandons its enrichment and reprocessing capabilities.'" During his speech last night, Obama warned lawmakers not to scuttle this deal by imposing new sanctions on Iran. "Doing so would derail this promising first step, alienate us from our allies and risk unraveling the coalition that enabled our sanctions to be enforced in the first place," Obama said. -- Eyes Wide Open: Reacting to criticism from the GOP and Israel, Secretary of State John Kerry told CNN that they were going into this deal with "eyes wide open." This deal is not about trust, he said. This a deal contingent on intrusive, on-the-ground inspections. "We're going to verify and verify and verify and verify," Kerry said. Plus, Kerry said, Iran has committed to neutralizing its higher-enriched uranium. So, under this plan, the country will go from having about 407 pounds of 20 percent-enriched uranium to zero. That, Kerry said, will extend the amount of time needed for Iran to build a nuclear weapon and consequently make Israel and Gulf countries like Saudi Arabia safer. "The clock is set backwards," Kerry said. -- Iran's Currency Jumped 3 Percent: The sanctions imposed by the U.S. and its allies against Iran have been crippling. Iran's currency, the rial, lost about two-thirds of its value against the dollar because of the sanctions. But Reuters reports that after the deal was announced, the currency gained a bit of traction, rising 3 percent against the dollar on Sunday. -- Iranophobia Lost, Says Rouhani: During a press briefing in Tehran on Sunday, Iranian President Hassan Rouhani said that these negotiations mean that "enemy" attempts to "promote Iranophobia" failed. "The result of the negotiations is that the G5+1 or, in other words, the world powers have now recognized Iran's nuclear rights," Rouhani said, according to the official state news agency Fars. "During the talks, the world came to understand that respecting the Iranian nation would bear results, and sanctions would not work." -- Deal Reached Through Secret Talks? Quoting "three senior administration officials," the AP reports that this deal was built on a year's worth of secret "high-level, face-to-face talks." "The discussions were kept hidden even from America's closest friends, including its negotiating partners and Israel, until two months ago, and that may explain how the nuclear accord appeared to come together so quickly after years of stalemate and fierce hostility between Iran and the West. "But the secrecy of the talks may also explain some of the tensions between the U.S. and France, which earlier this month balked at a proposed deal, and with Israel, which is furious about the agreement and has angrily denounced the diplomatic outreach to Tehran. "President Barack Obama personally authorized the talks as part of his effort — promised in his first inaugural address — to reach out to a country the State Department designates as the world's most active state sponsor of terrorism. "The talks were held in the Middle Eastern nation of Oman and elsewhere with only a tight circle of people in the know, the AP learned. Since March, Deputy Secretary of State William Burns and Jake Sullivan, Vice President Joe Biden's top foreign policy adviser, have met at least five times with Iranian officials." -- So What's Next? NPR's Peter Kenyon, who has been covering these negotiations in Geneva, tells Weekend Edition Sunday that what this preliminary deal has told us is that future negotiations will be very difficult. For example, Peter says, a grand deal would require the big sanctions on Iranian oil to be dropped. Those were passed by Congress and have to be dropped by Congress. If recent history is any indicator, getting anything through Congress will prove challenging. On the positive side, Peter points out, Ayatollah Khamenei, Iran's supreme leader, praised the deal, saying it could serve as a "basis for future prudent measures." His buy-in was essential for any of this to have legs going into broader negotiations.